You probably already know the basic story of Harry Potter, but if you don’t, this is what you need to know to make sense of the latest in the film saga. There are three young wizards; Harry Potter (Daniel Radcliffe), Ron Weasely (Rupert Grint), and Hermione Granger (Emma Watson). This trio is the magical equivalent of Luke, Leia, and Han from Star Wars, as they quest to defeat the evil wizard Lord Voldemort; the magical equivalent to Darth Vader. Our heroes believe they can defeat Voldemort by finding and destroying several magical trinkets called horcruxes. These trinkets contain fragments of Voldemort’s soul. The plot of the book that this film is based on is intriguing, so the film inherits a solid base that is captured once again by returning Harry Potter director, David Yates. 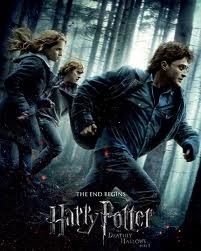 In comparison to the previous six Harry Potter movies, this film is much darker, with the presence of a real war between wizards and not just action in school with the history of evils hidden in textbooks. The development of the relationship between the three protagonists is more evolved in this film than in the previous productions, as seen in a more focused passion of the characters with the subjects of war and the coming-of-age of the three teenage friends. The sections in the book that were set in the tent where the heroes spend a large portion of their time carried a lot of emotional weight and the transition to film keeps that weight. Trust between the heroes is tested as anger and jealousy push the relationship to the brink. While the acting of most characters is satisfactory, the portrayal of Lord Voldmort by Ralph Fiennes is superb. It is somewhat disappointing that his character has so little time on screen. In terms of action, the film packs a powerful punch. The scene in which Harry and Hagrid are flying in the motorcycle and sidecar is viscerally satisfying. This scene is full of wizard curses and spells that emit streaks of red and green across the sky as wizards, witches brooms and magical creatures chase them. The sound effects are frantic and stimulating and convey the action onscreen accurately. The music, while not as good as in the prior films, is on-par with other action movies today. What makes this movie a standout is the backdrops. The scenic locations are breathtaking enough to be wallpapers on a desktop computer. One of the most enjoyable sequences is an animated scene about halfway through the movie. It is an artistic conveyance of somberness presented in a style of beautiful, animated silhouette puppetry. Harry Potter and the Deathly Hallows Part I is one of the better films in the series and fans will be happy with this installment. On the other hand, people who are not fans of the adventures of Harry Potter likely will not have their minds changed after watching this movie.